Established in 1995, XS Real has secured a firm foothold in the real estate market. In the current scenario of a crowded real estate market, it takes a lot, in terms of market knowledge, expertise, and confidence to come up with a pioneering concept such as XS Real’s Bungalow Apartment. In building homes to fulfill your dreams, XS Real is driven by its sense of aesthetics, attention to detail, and the passion to infuse your home with positive energy. Having successfully seen through numerous projects in the course of two decade’s operations that bear testimony to such capabilities, XS Real can confidently promise the prospective homebuyer, "lasting happiness." XS Real is keenly aware that fulfilling its "straight road to lasting happiness” promise is not only a huge commitment but also entails shouldering a very serious responsibility. Given XS Real's depth of knowledge and expertise in every area of property development, it is a promise XS Real can fulfill with certainty. At XS Real, quality at every step is the watchword. Beginning with site selection, it covers every stage and every aspect of a project—building plan and specifications, structural stability, and material; mix of apartment types; vastu compliance; financial dealings (please refer our "Say No to Cash” section); meticulous documentation; right through to on-time delivery. 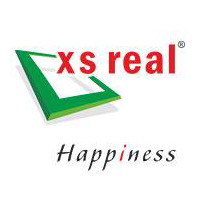 With XS Real the customer is truly on "the straight road to lasting happiness."